There are many alternatives for shading your deck or patio. It's easy to enjoy the outdoors throughout the day with a sunscreen for deck patio. Invite the warmth of the sun in the morning, but sit in comfortable shade in the afternoon. The style of sunscreen you choose for your backyard depends on the atmosphere you want to create and the uses of the space. This is the most versatile type of shade provider, as you can extend it gradually to accommodate your needs or retract it completely. Most awning and shade fabrics are made of a water- and fade-resistant filtering material with a varying percentage of sun density. Canvas, usually an acrylic composite, is still the most popular fabric because of its durability.There are dozens of colors and patterns from which to choose, so it's easy to find one that matches your outdoor furniture and accessories. Depending on the mechanism you select, the amount of necessary coverage, and the home's exterior, the installation process may be best handled by a professional. But some manufacturers, such as Sunsetter, stress the ease of installation. 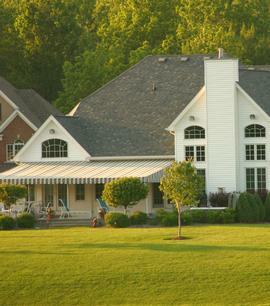 Shadetree Awnings offers assistance in finding qualified installers to help with your project. A trellis or pergola greatly enhances certain forms of architecture. These backyard additions might not block the sun completely, but have a lot of character, provide a respite from the heat, and host a variety of wonderful plants. If you have a deck or patio with a western exposure, building a trellis is an easy and decorative solution to block the sun. Plant a sun-loving climbing vine on the other side, such as honeysuckle or clematis, and you'll sit in cool, fragrant shade. Woodworkers workshop offers a number of free trellis plans. Many wooden trellises are readily available for purchase, too, and go up quickly with a few nails. Pergolas require a bit more carpentry skill than a trellis, but the effects are well worth the effort. This sunscreen for deck patio is a solid structure built into the deck or sunk into concrete alongside the patio. Securing the structure in this way supports the weight of the overhead beams or slats. After it's built, train vines to grow across the top, hang plants, or weave awning fabric in between the slats for as little or as much shade as you would like. With the right preparation, the weekend do-it-yourselfer can construct a pergola rather easily, although it helps to have a partner on this project. An exciting new trend in outdoor living is to create plush rooms off the back of the house. What might be concrete slab and some plastic lawn furniture now can quickly transform into a cool cabana with mounted shutters, canvas curtains, an outdoor kitchen and fluffy cushions. Shutters are usually thought of as storm protectors for windows, but this accessory is also a flexible alternative to solid walls when creating an outdoor room. With just a little framing, you can attach slatted shutters at an angle to reduce sun but let the breezes flow. Some owners construct one wall completely of joined shutters that extends off the corner of the house. This exterior "wall" blocks the sun in a decorative way but keeps the general area open. 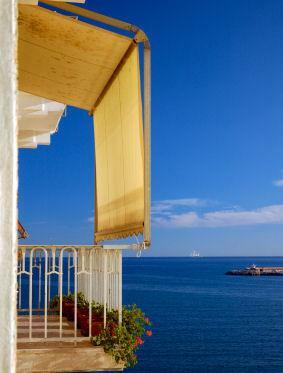 Curtains also block the sun well and can be mounted on existing architecture or onto poles or wood beams. Landscaping with fast-growing bushes or trees provides a beautiful, low-maintenance sunscreen for deck patios. Some trees reach their full height and crown radius in as little as three years, while others add three to nine feet of growth each year, providing gradual shade for patios and lower deck levels. Pick a variety suitable for your growing zone. There is a wide selection of fast-growing bushes and trees for every climate and region. Learn more about your zone here. Plant the tree half the mature crown's distance from the house. This ensures the health of the tree and alleviates potential home damage. Make sure you have the proper soil and positioning. Most trees are very hardy, but all need the right conditions to encourage strong growth. It may look nice on the patio, but don't put it there. Plant the tree in the yard, don't cement it into the patio. It will harm the tree, and the roots will eventually crack the patio in search of water.